‘Namdev Bhau in Search of Silence’ premiered at the Busan International Film Festival and then screened at the British Film Institute London Film Festival. The film now comes to MAMI for its India premiere. Dar Gai is its director from Ukraine and Dheer Momaya (both Mumbai-based) is the producer. Together they run Jugaad motion pictures. But how did they get here? The duo’s first feature film, ‘Three and a Half’, was filmed entirely in three long shots. With the third and final segment of the film pending, the team decided to leave town to shoot a crowdfunding film to raise post-production funds for the project. Leaving the noise and cacophony of Mumbai behind made them aware of how ubiquitous it was in their everyday life. 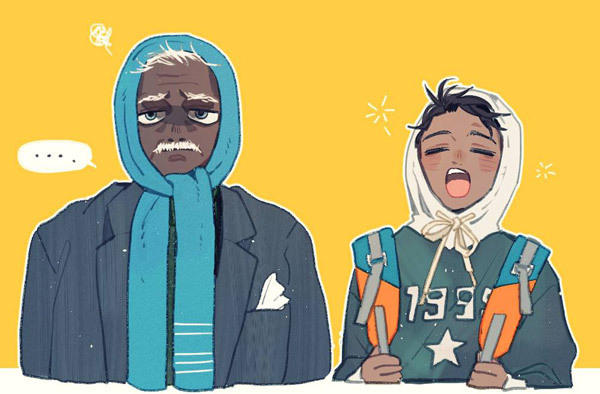 For Dar, being away was like “a burden suddenly lifting from [her] shoulders”. This is when Dheer conceived of a short film based entirely on sound design, which eventually evolved into ‘Namdev’, the journey of an elderly driver who goes silent and sets out in search of Silent Valley, tired of noisy, obstreperous Mumbai. The onset of monsoon in India limited the possible locations for the film. The remarkably untouched, dreamlike Spiti Valley in the Himalayas was ideal. With this in mind, and a story about a boy shared by her Director’s Assistant, fiction writer Kanishk Banka, Dar wrote the script in one week, a time she describes as “torturous”. Although she knew this would be a road-trip film, as to who would play the lead drew a blank. 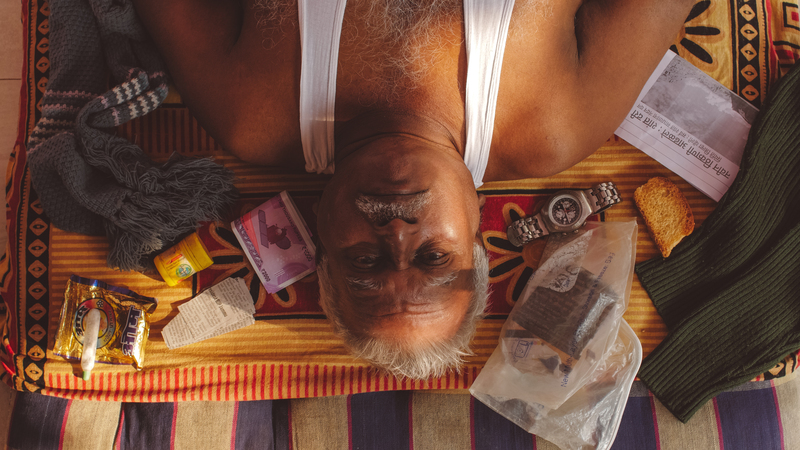 Enter Namdev Gurav, the driver for the Momaya family for almost three decades. For two years, Dar had been observing Namdev and was fascinated by his deep and dark sense of humour. His interactions with people suggested that he hated them all. Despite knowing that he would be impossible to cast, Dar named her character Namdev and wrote the script with him in mind. Dar and Dheer argued and bargained for over a day, with Dheer calling up noted Marathi actors and agents, even doing a few script readings. But Dar wouldn’t budge. Intuitively, Dar was convinced of her choice, but the first reading with Namdev, imaginably, was terrible. This man was used to driving cars and living sparsely. He was completely out of touch with the current film scene. For him, cinema and music as art forms had ceased to exist after the 60s. When asked if he would like to act in a film, he simply shrugged, as if to say don’t play the fool with me. It took a month and half of acting workshops with the director to get Namdev ready. Before which, Dheer asked if Namdev was willing to give them his time, he immediately said, “what’s in it for me?”. There was some money but not much. He then asked what they would feed him. Finally, he agreed at the promise of having samosas and chai every day. After the workshop, when they were set to leave for the shoot, Dheer asked Namdev pointedly if he would actually be able to do it. He said, “If you think I can do it, then I will”. Dheer teared up, realizing that Namdev had unconditionally given them his time and trust. Just as the impossible idea of Namdev acting was materialising, the location fell through. To begin with, Spiti Valley had logistical difficulties, the nearest airport was fourteen hours away by road. But against all odds, the crew was determined to shoot there. However, days before the flights were to be booked, massive landslides blocked access to the valley. 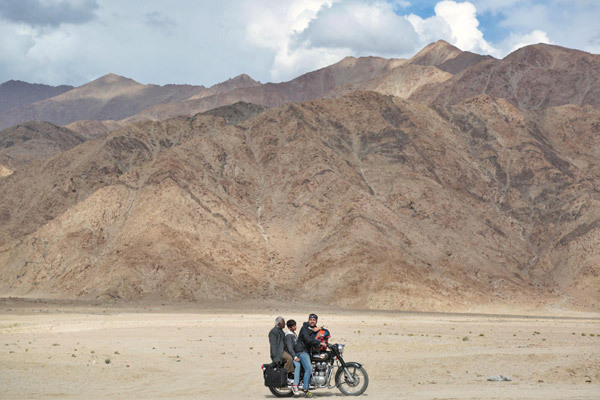 Almost overnight, the film had to be moved to Ladakh. Having written the script with endless research on Spiti, Dar was devastated, “It’s a beautiful place, Ladakh, but I saw no beauty there”. The recce happened on location just days before the shoot began. After Dar rejecting every single location for a day and a half, a reality check was needed. Dheer took her aside and told her, “You imagined some other place while writing the script, so be by yourself, take your time to find magic here. Adapt yourself and the script, and only when you feel love for this place start shooting.” Dar realized that they had no other option, she had to completely restructure the film. The film was shot in a “non-traditional” way, effectively, with a crew of ten people who took on multiple roles, as specialists for production design, script-supervision, etc. weren't affordable. The entire crew of Jugaad collectively handled makeup and production design. When they couldn’t find a suitable hut for an important scene, first-time ADs built it from scratch in six hours, even sawing the wood themselves. ‘Namdev’s’ impossibly small budget grew as the shoot progressed. The target could only be met by many technicians waiving their fees, which usually would amount to more than the film’s entire budget. This included the film’s Italian music composer, Andrea Guerra, whom Dar contacted on Facebook with a mood-reel of the film, for which the temp-music was from his ‘The Pursuit of Happyness’ track. He loved what he saw and came on board. And so did editor Shounok Ghosh, who cut the film for no charge, and gave it its unique fast-paced feel that Dar always had in mind. Dheer, in turn, ensured that they all got some amount of intellectual property rights (derivate and remake), effectively making all their heads of departments co-producers on the film, who got their assistants to work for free. 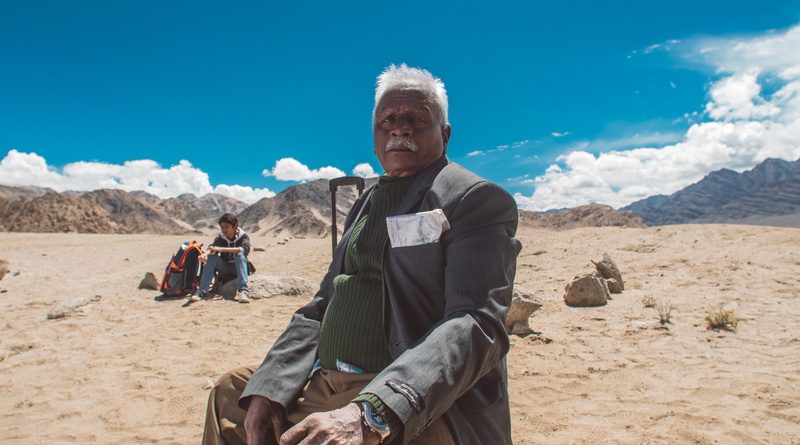 Adding to the many constraints, there was no time to acclimatize to Ladakh’s high-altitude. Namdev has rheumatism and barely walks in Mumbai. But in Ladakh, he had to walk at least 2 km a day. On the tenth day, he felt really unwell and was bedridden for two days. Despite everyone’s assurances, Namdev felt guilty about letting the entire crew down, “who were there just for him”. Dar shares, “I realized, behind this mask of a guy who doesn’t care, there is a person who understands and cares for all of us in this weird, coming-of-age journey”. This was Dar’s first road-trip film, with the entire crew a long way from home, and Namdev’s first time on a flight. He hadn’t left Maharashtra his entire life, or even Mumbai, except for forays to his village. One night, during production, he opened up about his family and how important the film was for him. “It gave him purpose”, says Dheer. “He thought he would drive a car till the day he died”. He now had drivers of his own, people holding umbrellas out for him. Remarkably, during the shoot, Namdev matured tremendously as an actor. During the final shot, which was the film’s climax, Namdev had actual tears in his eyes. But, at ‘cut’ he instantly snapped out of it. In many ways, both of Jugaad’s films have had similar journeys, with constraints making it feel at times more like firefighting than filmmaking. Through it all, a key learning has been that in the pipeline of making a film, what matters is not the size or the name of the studio, but people with whom you share mutual trust and respect; people who will fight for the film and for their vision of it, not out of ego — but out of what they believe is best for the film. Finally, Dar puts it best, “Maybe it is a romantic thought, but I feel when we watch films on a big screen, the energy that is exchanged during various stages of production, somehow transmits on to the film. Despite some technical shortcomings, this energy helps the audience get involved with the project. They feel, I guess, the love which was shared in the process of filmmaking”.